Magic of the Holidays--Make Your Celebration Festive and Fun! Magic of the Holidays is a fun, non-denominational magic show filled with amazing magic, stunning illusion, hilarious comedy, seasonal music, and lots of good-natured audience participation. It's an exciting, fully-staged magical celebration, guaranteed to put even the most Scrooge-like among us into the holiday spirit. 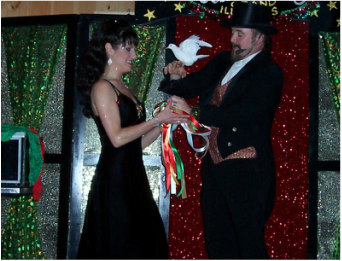 Perfect for your company's holiday party, December community event, children's Christmas party, or school pre-vacation assembly, Magic of the Holidays is performed by Maine magicians and illusionists Markus and Angelique Steelgrave. This show is available in Maine, New Hampshire, Massachusetts, and Rhode Island. "WOW, what a spectacular show the other evening!! Can't wait to see you again!" Programs can run 30 to 75 minutes; each version features seasonal music, holiday-themed backdrop, and wonderful magic with a holiday feel. Your employees and colleagues literally "get into the act"! If you wish, add a "grand illusion" or two. Plus, strolling close-up magic is perfect for social hour as guests arrive and mingle. Then, after dinner, the magic show begins. Contact us for details! Thank you for performing at our annual Christmas Party at the Augusta Civic Center. We have had other entertainers over the past 4 years and by far this was the best we have had! 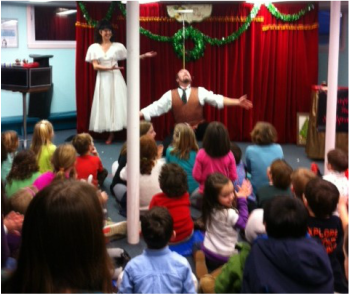 The children and adults were riveted by the performance. Our goal was to keep the children entertained during happy hour and they were not only quiet, but were mesmerized by the show! The skill of the show and stage presence was impressive. We have booked you for next year's Christmas Party and look forward to another great performance! I would highly recommend The Magic of the Steelgraves for any special event. Their exquisite magic entertainment for our company holiday party was wonderful. They certainly kept everyone interested and engaged. We have heard comments such as 'best Caron party ever' to 'can they come again next year'. One of the kids who attended is still talking about his special night with the 'magic people'. You will not be disappointed with their performance. ​Staff and students will enjoy this 30 or 45-minute show, filled with fun comedy magic with a holiday theme! Shows are tailored for the age/grade level, whether pre-school, elementary school, middle school, or high school. Can be set up in about an hour; minimum space needed 10' wide x 8' deep. "Grander" shows require more set-up time and space. Fill those antsy "just-before-vacation" days with something the kids will look forward to, and remember for a long time. 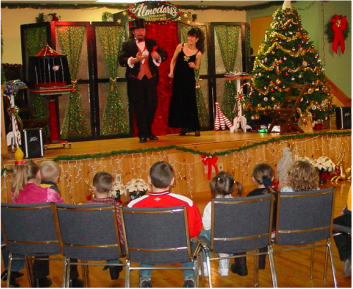 Our family magic show brings your community together to enjoy the spirit of the season. Anywhere a touch of Holiday Magic is desired! ﻿Rates vary depending on size and type of show. Contact us for details. For another type of Holiday "Magic", invite Santa and Mrs. Claus to visit your organization! Click for details.